I like the houndstooth, it's lovely. 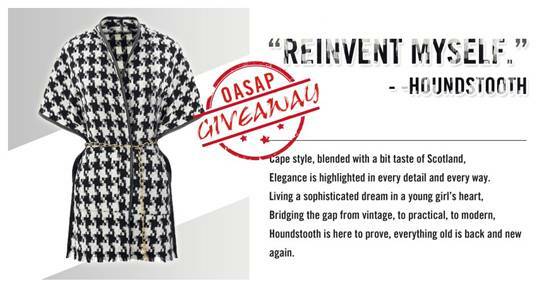 I like the Black White Houndstooth Pattern Cape Coat! I have liked OASAP on facebook and followed OASAP_official on Instagram. I like both of these but I would get the houndstooth one. I love houndstooth and it goes with so many things. I am following you on GFC and fb. I am following OASAP on fb and Instagram. For the extra entries i am following on twitter and pinterest. I like the Black White Houndstooth and think it would look awesome with skinny jeans and boots! I would really love to have the Houndstooth Cape! I love the Houndstooth!! I'm in love with this print! Followed LETS DOLL UP via gfc. Liked this blog on Facebook. Followed http://lookbook.nu/oasap, http://facebook.com/oasap, and https://twitter.com/Oasap. I hope that covers everything! Tanks so much for the giveaway--LOVE it! My username at GFC, Pinterest, Lookbook and Facebook is Paula Lemos, at twitter is @ap_lemos and at instagram is paulalemos1963 and I did all the entries. Thanks for the chance; my favorite is the Brown Elk Pattern PU-Trim Cape Coat. I would love the Brown Elk Pattern PU-Trim Cape Coat! I Follow LETS DOLL UP via gfc and on Facebook! I like your Facebook page (Pamela Hallgan). I follow OASAP on Pinterest (pam2424). I follow OASAP on Facebook (Pamela Halligan). I follow Oasap on Facebook as Linda Kwolek. I love the Elk Cape. I'm following oasap on Facebook. I registered at oasap.com for their newsletter. I already LIKE Oasap ((HollyCunningham)) on Facebook, love their "stuff"! AND I'm a new follower of yours ((HollyCunningham)) on Pinterest. too! Fingers crossed, really love this cape! I like the Black White Houndstooth Pattern PU-Trim Cape Coat.